Colonial® is focused on and dedicated to the empowerment and training of our employees, and in the past couple of weeks we’ve had a couple of great sessions with the aim to do both of those things. This past week, Colonial Parking® hosted our third Town Hall meeting at our headquarters in Georgetown. We believe these Town Hall Meetings are having a positive impact on our company and our employees. 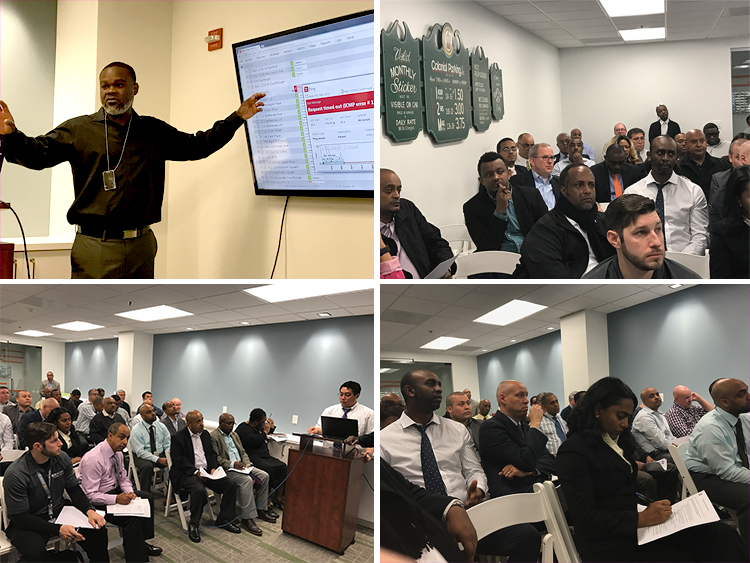 Similar to City Town Hall Meetings, ours is a place where employees can come to voice their opinions, concerns or ideas directly to our Executive Officers and those Officers can address the employees’ questions and also inform them of new changes and progress within the company. This session included Colonial Parking’s owner and Executive Chairman, Rusty Lindner, Executive Vice President of Forge Company, Bereket Woldu, Colonial Parking’s CEO and President, Andrew Blair, Executive Vice President and COO, Will Cook and Executive Vice President and CFO, Ron Peck. Also present were over 70 of Colonial’s employees, from both our locations around the region and our headquarters. At Colonial, we truly understand that our employees are our best and most important asset. Their fervor for, and dedication to, their jobs is what makes Colonial the best parking company in DC, and our goal is to always ensure that they are not only happy with their employment, but also empowered to speak up regarding their thoughts and new ideas. All levels of Colonial managers hold an open door policy where employees are welcome to come to them to discuss matters they feel are important. We feel these open forum discussions just add another layer of internal transparency and openness that best serves our employees, and through them our customers and clients. At Colonial, we pride ourselves in being innovative, especially regarding the technologies we use to stay ahead in the parking industry. However, even the best advancements in technology can go to waste if members of our team are not properly trained to utilize all aspects of our provided technologies. With that in mind, Colonial recently hosted the latest installment of its Tech Forums. These gatherings serve to ensure that our operations managers are provided the proper tools and knowledge to help make their jobs easier, while providing comprehensive knowledge to ensure the best service to both our customers and clients. This past installment focused on new mobile applications to monitor equipment connectivity in real time, troubleshooting for various equipment types, such as Amano, Skidata and WPS, and a presentation by Sentry representative Brent Belmont. Additionally, the operations team was able to enter into a lively discussion with members both asking questions and answering questions for their colleagues.